WHAT ARE VESTIBULAR EXERCISES ? Considered to be one of baby’s most highly developed senses at birth, the vestibular system is responsible for balance and motion perception. It also plays an essential role in maintaining the head and body posture. Whenever baby is in constant and fluid motion, her vestibular system is being stimulated. Recently, a reader wrote in and asked for some references to vestibular activities in babies. These activities can be categorized into motor skill movements baby creates on her own and movements experienced while a parent is holding her. Research shows that babies may develop more advanced motor skills when they experience vestibular stimulation regularly. Look at the list of below and see if you can add some of these activities to your playtime with baby. Keep in mind that slow moving actions tend to be soothing to baby while faster ones are usually more stimulating. Please send me a comment if you would like to add one to the list! For many years women around the world have carried young babies in wraps and packs on their backs while they go about their day’s work. Fortunately for babies, that trend has been returning. Research shows that the baby wearing trend helps to reduce crying and improve emotional bonding between the mother and baby. The best-selling parenting book “The Happiest Baby on The Block” by Dr. Harvey Karp emphasizes the benefit of vestibular stimulation on newborns. In fact Karp teaches that newborns need the stimulation to recreate the experience of being in the womb when their mother was in constant motion. This has a calming effect. Hannaford, Carla. (2005) Smart Moves: Why Learning Is Not All In Your Head. Salt Lake City, Utah: Great River Books. Karp, Harvey, M.D. (2002) The Happiest Baby On The Block. New York City, New York: Bantam Dell. Who can resist buying an adorable pair of baby shoes for a baby gift? They are adorably small and come in stylish designs for both boys and girls. However, when a baby reaches the motor skill milestone of walking it is important to carefully choose her shoes. Prior to walking the baby should primarily wear socks and they should not fit too tight. Before she has learned to walk, soft booties are OK to wear in the cold weather to keep her feet warm. Once she begins to walk shoes should be carefully chosen with the understanding of how the construction of the shoes affects baby’s movement of walking. How do baby shoes affect her walking? It depends on the materials and construction of the shoe. Materials vary from soft cloth fabrics, resembling a pair of socks, to very stiff and hard rubber. In between these two are several variations. The material used in making the shoe determines how flexible or stiff the shoe is. The soft cloth-like fabric is very flexible and bends easily where the extremely stiff rubber does not bend at all. The flexible materials allow for more movement to occur in the bones and muscles of the feet, more adjustments as baby tries to maintain her balance. The stiff materials do not move as baby walks, they stay more rigid and fix the foot and ankle in place. Usually the softer and more flexible shoe is the best option because it allows for the movement of the foot. The softer shoes provide protection for the soles of the feet from the outdoor elements yet allow her to use her bones and muscles as she walks. The stiffer materials often make it very difficult for baby to walk because she can not easily balance. Her feet are more rigid in these shoes. However, there may be situations where this shoe is preferable, such as for a baby with low muscle tone who may need some extra stability which the shoes provide. It is important to be aware of the differences in materials and to choose what is best for your baby’s motor skill development. Once you have decided whether to look for soft or firm shoes, it is important to understand the value of good shoe construction. In our culture today the shoes that are extremely popular across ages and sexes are shoes that are easy to put on and easy to take off. These often include slip-on clogs or velcro closing styles. For both babies and children it is extremely important to choose shoes that are built so they will stay on the foot securely. This usually requires shoe laces, a snug fit that is not too tight, or well-designed velcro that securely latches. A loose shoe is a common factor in accidents such as falls, even in adults. When a shoe slides around it causes a baby, and even an adult, to slip or trip on it and down they fall! When baby shoes do not fit securely the body alters the mechanics of walking to keep the shoe from falling off. For example, a clog-style shoe (such as the popular plastic crocs that toddlers wear) can easily slip off the foot. The baby or toddler (and even adults) wearing them learns to walk so they do not properly roll through the foot because when the front of the foot is down and the heel is lifted the shoe can slip off. 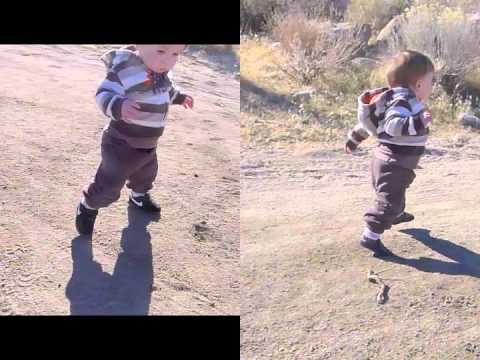 They start to walk a bit flat-footed like a duck which leads to poor development of motor skills such as running. A mother of one of my 12 month-old stellar caterpillars said to me, “I bought her some shoes but she keeps falling in them. I don’t know….she can’t seem to wear them.” I asked, “Would you like me to take a look at them? They might be a bit too stiff.” She brought them in so I could see them and they were an adorable pair of sneaks with laces, which was good, but made of very stiff rubber, which was not so good. When we tried to bend them, they would not bend at all. She observed, “Yes…they are really stiff.” I explained how she might be better off with more flexible shoes so she can move her bones and muscles better as she walks. I also reminded her that since her daughter is walking, she needs textures soles or she will slide right down onto the floor. She revisited the store, made a better choice and her daughter is now walking comfortably and confidently thanks to flexible soles and a snug fit! The mother of my 11 month old stellar caterpillar student said to me, “She keeps falling down! I am afraid she will hit her head.” At 10 and a half months, after a lot of crawling and cruising, this baby embarked upon a new milestone: walking! She walked about six steps at a time and then plopped down on the floor after losing her balance. After a couple more weeks she could walk 10 steps or so before falling down. Now, she is turning one year old and she is walking distances quite quickly and confidently–a true stellar caterpillar! 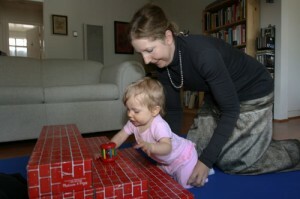 The development of a baby includes learning balance with motor skills. Balance is learned very gradually. As babies learn to walk they can balance for only a few steps at a time. As their balance improves they can take more steps before falling down. Of course we see them sometimes choosing to crawl if they want to reach their goal very quickly! There are many muscles and bones in the foot. There are also two arches which help provide stability when we walk. When baby first begins to walk, her feet are rather flat as she steps. With time the muscles and arches gain strength and we can see the weight shift from one part of the foot to the other as baby walks, and her foot no longer appears “flat.” It is strength in the foot muscles that baby develops as she takes her first steps and falls. If you look down at her feet you will see the slight wavering of the foot as she shifts around to gain balance. The stronger the foot muscles, the better baby’s balance, and the more stable she is when she walks. If your baby is walking and falling, this is probably a normal part of developing her skill of balance. You should see her gradually increasing the number of steps she can take before falling down. Remember to babyproof so those falls aren’t too painful. Bumpers for the corners and edges of tables are a must! Move any pointy or hard objects off of the floor to avoid baby falling on them. And if you have not already thoroughly babyproofed your home, now is the time to do so. Do you see how much fun this is to play on the stairs? I feel very stable and balanced with one arm off the stairs. This is very new....learning to go up to a higher step. My teacher is showing me how to climb to the top. This is Madison’s second time to climb the stairs during her Stellar Caterpillar lesson. If you missed it, please read my post about the introduction of the baby stairs to Madison. Each time she climbs, guided by her teacher, she is more balanced and more stable. The teacher uses her hands to support the baby on the stairs, gradually reducing the amount of support as the baby learns to manage them on her own. She feels very proud when she makes it to the top! It is a fun activity for her which improves the motor skill of crawling. She is learning to put weight on her hands to support herself as she does when crawling. With the stairs we have a gradual introduction of the hands to the weight bearing position because the stairs are elevated. The hands bear less weight when elevated on a stair than if they were on the floor in the true crawling position. Guiding baby up and down the stairs should be tried with an instructor only and not on your own at home for safety concerns. At 7 months Madison demonstrates excellent balance, coordination, and proprioception. These are three important components of motor skill development in babies. In the above photo Madison is playing with the rattle while securely balanced on her right elbow. Her left big toe is carefully anchored to the floor for a bit of extra stability, but often she lifts that leg up into the air while still balancing and shaking the rattle. She discovered this position on her own just before turning 6-months-old, and quite awhile after mastering the skill of rolling. Proprioception is the ability to feel ones body parts individually, in relationship to one another, and in orientation to the environment. Balance improves when baby clearly feel all of her body parts in relation to one another. In the above photo proprioception allows Madison to feel that when she puts her big toe on the floor the rest of her body is more stable. It also gives her a very clear feeling of her elbow and how her elbow supports her shoulder, ribcage, and entire torso. Learning to feel and to use the elbow is an important micro-skill embedded in many motor milestones: lifting the head, rolling, and belly crawling. To find stability in this position, Madison needs to organize the placement of her elbow and big toe as she rolls onto her side. Once she has achieved this, she is free to play with the rattle. These activities happen in a quick moment. In one minute she is on the floor on her belly or her back and then she rolls to her side, props herself up on her elbow, and shakes her rattle. In just a fraction of a minute she manages to organize all of her body parts so she is stable and can enjoy playing with her toy. This is coordination–successfully moving and arranging her body parts so she can do what she wants to do or get what she wants to get. 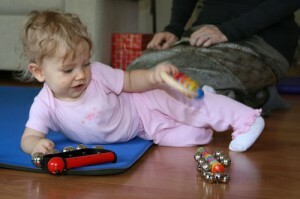 In this photo, her goal is to play with the rattle in a position she enjoys: balancing on her side. Coordination is an important part of the skill of balance.